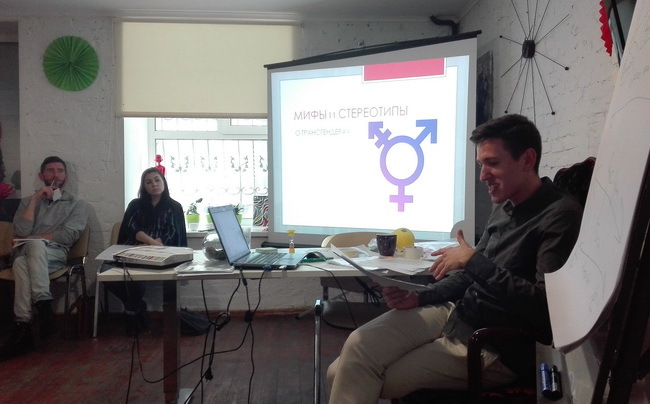 Training for hot lines employees regarding tolerance and non-discrimination in distance counseling took place in Queer Home Kyiv. It was held for LGBT crisis counseling line, National Children Hot Line, National Domestic Violence, Human Trafficking and Gender Discrimination Resistance hot line and All-Ukrainian Hot Line for HIV/AIDS and Tuberculosis Questions line. Theoretical part of the training gave its participants lots of new information on consulting transgender and intersex people and exercises solidified this new knowledge. The counselors got to know more of transgender as “umbrella” notion consisting of many subgroups, of sexual orientation, gender identity and gender expression. They learned to make distinction between them and also the ways of counseling with due regard to SOGI information given by the caller. Special attention was paid to wording and tactful addressing the callers. One of the counselors pointed out that people that are somehow different from majority draw a lot of attention and trigger question in this world that we believe to be gray. “I wanted to colour the world around so there would not be such a separation. We should remember that our world is beautiful in its diversity,” she believes. At the end of the training the counselors participated in so-called “aquarium” exercise. Two training participants tried on the roles of a counselor and a caller with gender identity issues. The rest of participants made assessment of the counselor’s mistakes and her wise decisions and then discussed what way of holding a conversation would be most tactful. Training is part of GAU and La Strada Ukraine partner program. In frames of this program La Strada trainers organize workshops on resistance to domestic violence and human trafficking in Queer Homes of different cities. “We have the same direction of work. It’s very important that people asking for help felt that they are understood. LGBT people are in all strata of society and age groups that is why the counselors of all crisis counseling lines must understand these people and know their problems. I believe that mutual trainings are necessary for improving the quality of counseling,” GAU executive director Volodymyr Naumenko thinks.